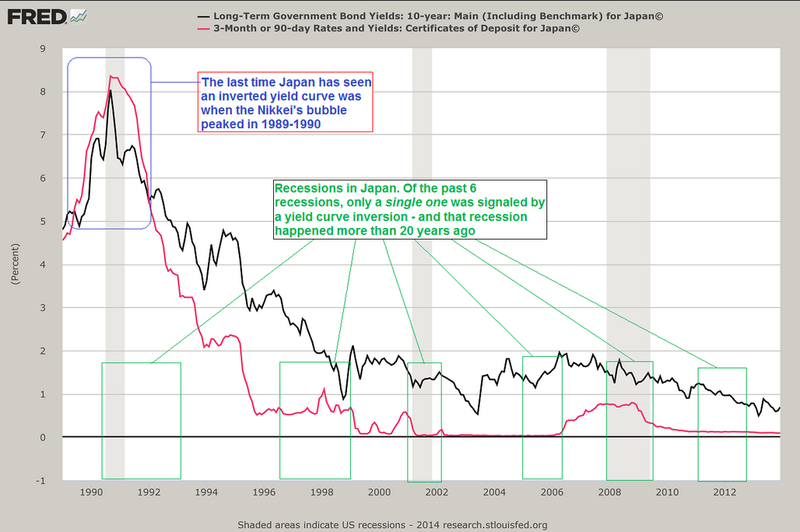 Mish's Global Economic Trend Analysis: Flattening of the Yield Curve in Pictures; Is an Inversion Necessary to Signal a Recession? 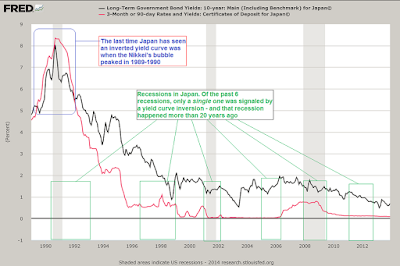 Flattening of the Yield Curve in Pictures; Is an Inversion Necessary to Signal a Recession? Inversion is the traditional harbinger of recessions, but with the low end of the curve still very close to zero despite the first Fed hike, inversions are unlikely. In general, albeit with some volatility, the yield curve has been flattening and spreads shrinking since 2013. If the economy was truly strengthening, one would expect the yield curve to steepen, with rates rising faster at the long end of the curve rather than the short end of the curve. But that's certainly not happening. Is an Inversion Necessary to Signal a Recession? 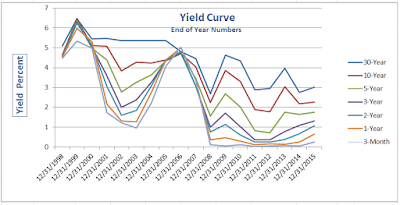 Many believe no recession is on the horizon because the yield curve is not inverted. Pater Tenbebrarum at the Acting Man blog dispels that myth in A Dangerous Misconception. There are very few market indicators that can predict recessions without sending out false positives. The yield curve is one of them. At a breakfast earlier today, LPL Financial's Jeffrey Kleintop noted that the yield curve inverted just prior to every U.S. recession in the past 50 years. "That is seven out of seven times — a perfect forecasting track record," he reiterated. This is it! The holy grail of forecasting, Jeffrey Kleintop has discovered it. You'll never have to worry about actual earnings reports, a massive bubble in junk debt, the sluggishness of the economy, new record levels in sentiment measures and margin debt, record low mutual fund cash reserves, the pace of money supply growth, or anything else again. Just watch the yield curve! Over the past 25 years, the “perfect forecasting record” has worked exactly 1 out of 6 times in Japan – and that was in 1989. There is no “holy grail” indicator that can be used to make perfect economic and market forecasts. It is true that if there is a yield curve inversion, it definitely indicates trouble is on the horizon. Alas, we don't remember hearing many real time warnings (in fact, we don't remember any) from Wall Street analysts when such inversions actually occurred in the past (such as e.g. in 1999/2000 and 2006/2007), which makes this new preoccupation especially funny. Obviously, the only time to pay attention to this indicator is when it suggests that a bubble can keep growing! There is only one thing that is certain: things will continually change. There is no indicator that is fool-proof. I captured the charts at the beginning of this post on December 31. With the 2016 opening equity carnage today, the curve will be flatter at the end of the day. The yield curve does not believe the economy is strengthening, and neither do I.